When Occupy Oakland first started, I was skeptical and frankly unimpressed. I stopped by the rally on that first Monday at 4pm and was underwhelmed by the turnout. At most, a couple hundred people were there. The rally took place on the corner of 14th and Broadway and the sound system (or maybe just a bullhorn) wasn’t loud enough and it was difficult to hear. I chatted with some friends I ran into and went back to work. Day by day tents went up in Frank Ogawa Plaza and I became much less underwhelmed, especially once infrastructure was developed. The occupiers organized a communal kitchen, library, schedule of events, and of course port-o-potties. I work in Frank Ogawa Plaza so passed the encampment every day, often multiple times per day. I appreciated that it was mostly quiet during the day and amplified sound never started until 4 or 5pm. At night I felt safer walking around in the area, as there were tons of people around. I developed an admiration for the occupation and defended the occupiers to friends who were frightened and annoyed by the encampment. Yet I was still skeptical. I expressed to many that while I thought the Occupy movement was doing a great job changing the dialogue in our country, it wasn’t a movement I could participate in because I didn’t understand the end game. I’ve taken part in much advocacy and several movements, and I’ve always had a clear goal in mind (even if it was a goal I knew wouldn’t be attained for many years, like stopping the federal attacks on medical marijuana – a goal I chipped away at for nearly a decade and which still hasn’t been met). I didn’t understand the goals of Occupy Oakland. Did they just plan to occupy our municipal plaza forever? What would constitute victory? Without understanding the end game, no matter how much I respected what Occupy Oakland was doing, I didn’t see a point in participating. My skepticism started to fade a week ago, when I woke up on Tuesday morning to hundreds of tweets and dozens of stories about the police raid of Occupy Oakland. It hit me that morning, sitting at home, how much people had been putting themselves on the line for something they believed in. That was something I can relate to, as I developed and grew as an activist under the wings of two amazing mentors who firmly believed in the power of non-violent direct action and civil disobedience. My admiration for the occupiers and their supporters grew on Tuesday night, as I watched from the safety of my home the horror that occurred in downtown Oakland. Many people withstood multiple rounds of teargassing (and some much worse), yet they stood their ground for their right to occupy Frank Ogawa Plaza and stood up against the jailing of their fellow occupiers. By Wednesday, I realized something big was happening, especially when I saw thousands of people gather in Frank Ogawa Plaza at night. Still though, I was just a spectator. I watched the general assembly and left before folks split up into groups, going home to follow what was happening on Twitter. But I was drawn in enough to come back on Thursday night. I planned to just watch again, but when I arrived at 6pm for the general strike planning meeting, almost immediately groups split off to plan things like media, outreach, and logistics. So I joined the (huge) media team and just listened – there were dozens of people and with so much process, little seemed to be getting done. Finally a few people suggested we split into smaller groups, and we did. I joined the group to work on the general strike press release and press conference and am so glad I did. I was blown away by our group of about 15 people and have been continually impressed by them over the past several days. About 2/3 of the participants were media professionals – several worked for independent media outlets, a few of us did media work for non-profits or campaigns, one guy worked at Pandora, another worked for an ad agency. We talked about what we needed to do for the media advisory, press release and press conference. And I say we for the first time because all of a sudden I was no longer a spectator. I hadn’t planned to, but I was participating. I woke up the next morning to an email from one of the participants with a link to an online workspace she had built for us to use. All of us had equal access to this workspace. By mid-day two women had drafted the advisory and press release. A few of us met again that evening and further hammered out details, deciding that we needed to identify some Occupy Oakland storytellers (since there are no official spokespeople for Occupy Oakland). I went home and put together a media contact list and uploaded it to the workspace. And over the weekend people in our group met some more (I was unable to join them but appreciated reading the notes). They planned the general strike press conference that happened yesterday afternoon and sent out a media advisory. The press conference, which I attended on Monday, was a huge success. (If you missed it, you can watch the video of it here.) The speakers were all incredibly powerful and shared their stories of why they’re taking part in the general strike. One woman’s home was being foreclosed by Chase bank, another woman was an educator who was frustrated by the diminishing funding for education, and someone from the ILWU union spoke about the issues facing workers and about Oakland’s 1946 general strike. I was amazed that in just four days a small group of people – most of whom had never even met – were able to pull this off. Being involved in this small group made me remember that the end goal isn’t the only important part of a social movement. The process itself can be very powerful. Occupy Oakland has brought together thousands of activists and Oakland residents, many of whom probably never would have worked together otherwise. It’s brought media attention to the economic inequities in our country and in our city. The small number of people who have committed acts of vandalism and violence during Occupy marches have spurred a much larger group of people to organize as peacekeepers, and they were incredibly effective at keeping the peace during Saturday night’s march. 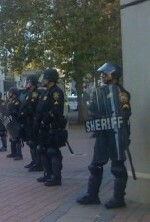 I must admit that I still don’t know what the end game is for Occupy Oakland. I don’t know what it would take for occupiers to feel like they have met enough goals for them to end the occupation. But I’m okay with that, especially since I’m not planning to camp with Occupy Oakland. At this point I’m satisfied with participating in ways that make sense to me, like helping with media, donating books to the library, and tweeting as much as I can about what’s happening. Because that’s the beauty of the Occupy movement. Everyone can participate in their own way, and that might not even involve coming to Frank Ogawa Plaza or taking off work for the general strike. I love what one small, locally owned business is doing, for example. Awaken Cafe is staying open tomorrow during the general strike but will be donating 10% of its sales to the Alameda County Community Food Bank and 10% to the Ella Baker Center. That is Awaken’s way of standing up for the 99%. On Monday, I talked to one of the volunteers who’s organized Occupy Oakland’s library. He works at the Oakland Public Library and will not be striking tomorrow because he feels it’s important for the libraries to continue to serve the people of Oakland. I hope you’ll join me today, November 2nd at the general strike or will find your own way to support Occupy Oakland and the 99%. Join us at the mass gatherings at 14th & Broadway at 9am, 12pm and 5pm. You can find out more details on the strike web page. Maybe you can’t strike today or don’t want to participate that way. Some are suggesting to buy nothing. I suggest buying locally. Skip Starbucks and go to your local coffee shop. Skip fast food and buy lunch at a local restaurant. I know some Oaklanders who are very concerned about independent local businesses being targeted during the strike. I not only hope that that will not happen but will be participating to help ensure that it does not happen. On Saturday night a few dozen peacekeepers were able to stop violence and vandalism. Imagine what hundreds of us can do. This piece was first published at Calitics.